After years of arriving early to work and staying late, you’ve finally been promoted. Your new position allows you more freedom, creativity and the opportunity to travel. You’re immigrating to one of the best countries in the world, Australia. Because of its high quality of life, Australia has been ranked the second-best country in the world to live in. According to OECD Better Living Index, Australia ranks tops in environmental quality, health status, housing, personal security, jobs and earnings, education and skills. If you’re moving to Australia temporarily or permanently, then you should read this article and educate yourself on the type of life insurance cover options available for your consideration. The following article focuses on helping non-Australian citizens find affordable life and/or income protection insurance. At 30 June 2015, 28.2% of Australia’s estimated resident population (ERP) was born overseas, that’s a staggering 6.7 million people. The latest figures from Net Overseas Migration (NOM), reveal a whopping 168,200 people were gained within 2014-2015 period alone. The life expectancy of people living in Australia is 82 years old, two years higher than the OECD average of 80 years. Compared to the above immigrant population, Australia has by far the highest life expectancy. China’s average life expectancy is 75 years, Vietnam 73 years, India 68 years and South Africa average life expectancy is a mere 62 years. No wonder Australian insurers are concerned you’re not taking out insurance in their country, to then move back to your country of origin, which often has a much lower life expectancy. 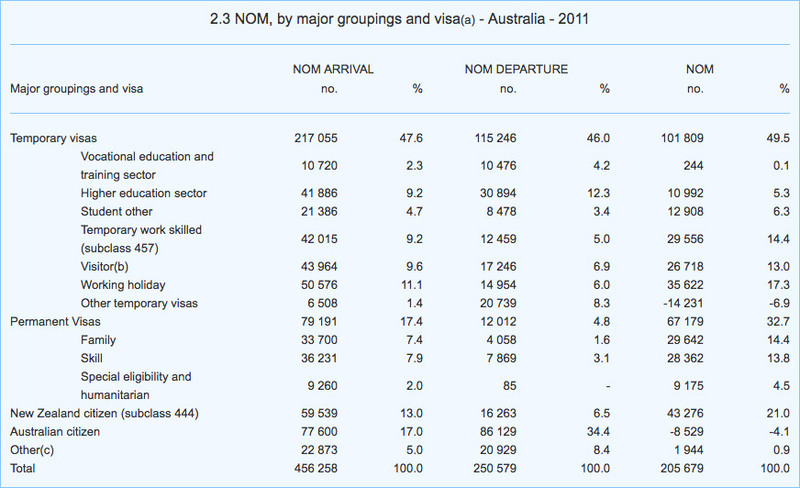 As shown below, there are many individuals living in Australia, who aren’t Australian citizens. People who recently moved or are planning on moving to Australia can benefit from reading this article. When moving to Australia your exiting policy may require some supplemental coverage. Depending on the terms and conditions of your existing insurance policy your will find most will allow you to continue your cover. However may not or may not now provide the level or type of cover your family will need in Australia . In cases where you’re not covered overseas by your existing plan, we suggest contacting an Australian insurance specialist, such as Life Insurance Direct. We understand that there can be a number of uncertainties when you are weighing up the pros and cons of taking out cover through and Australian insurer vs retaining your existing coverage. There are a number of considerations such as, costs, coverage and /or you may have a whole of life or endowment style policy from your country of origin which may be worth retaining. It’s understandable that you might be feeling a little overwhelmed at this point and we are here to help while we haven’t answered all questions we get here is a some information below to guide you in finding affordable life and/or income protection insurance in Australia. You are strongly advised to take out appropriate to cover yourself in Australia as the financial impacts of being prematurely passing away, becoming disabled, suffering from a significant sickness or accident can have a major impact on your family’s financial wellbeing. Depending on what visa you hold, you’ll have different insurance options available to you in Australia. Generally, anyone holding a permanent residence visa will find it much easier to obtain cover, and receive similar benefits to an Australian citizen, than a non-citizen on a temporary visa. However, it important to know that most people are granted a type of temporary visa first, then while in Australia they apply for their permanent residency (PR) visa, after which they become a citizen, if the PR was accepted. The partner visa is most common in this stream. This is where you are in a genuine and continuing relationship with an Australian citizen or Australian permanent resident. You need to have relevant qualification, work experience and skills that Australia is in demand for. There are currently over 150 different Australian visas, both temporary and permanent. If you’re unsure about which visa type to apply for, visit the Department of Immigration website for assistance. Below is a list of visas accepted by most Australian life insurance companies. Please note that this list is by no means comprehensive, and may vary depending your personal circumstance therefore it’s advisable that you contact an insurance specialist for help. Depending on your visa, you might want to take out additional or new insurance cover for you and your family. But before you do that, make arrangements to review your current coverage. If you decide to keep your current policy, take copies of all your documentation with you. If you have then decided you need additional protection or want to replace this policy then you need to know the following. It’s a good idea to bring copies of any past medical records for you and your family with you when you move to Australia. If you have children, bring their immunisation records as well, these are needed by schools and child care centres. When applying for a life insurance policy from an Australian insurer, a typical questionnaire will include questions about your immigration status. You’ll need to confirm if you’re an Australian citizen or have an Australian Permanent Resident’s visa. The amount of time (years and months) you’ve lived in Australia. Your future plans for obtaining permanent residency and when this would likely be granted. The type of visa you have and when it expires. The country you were born in. Your nationality and in which other countries you have residency/citizenship rights in. Clearly advise where you’ll be traveling to. The date of your departure and the frequency of which you intend to travel. The duration and purpose of each trip must be clearly stated within your application. Is it for business or personal reasons? You must indicate if you intent to move overseas, even if just temporarily, and where you plan on living. A territorial exclusion may be put onto the policy if you are deemed a “higher risk”, because insurers are concerned you might move back or onto higher risk counties where there is a higher risk or war or terror attacks, or it may be difficult for insurers to translate/validate your medical records, or the country you’re intending to travel to does not have adequate health care. Used for permanent residents who are either working or intend to take an extended holiday (greater than 3 months) in countries such as Canada, US, UK, which have good health care facilities. After three monthly benefit amounts have been paid, the insurer shall not be liable to make payments under this cover in respect of any period during which the life insured is travelling or residing outside of the territorial boundaries of Australia or New Zealand. Used for permanent residents who are either working or intend to take an extended holiday (greater than 3 months) overseas in countries in which it may be difficult to manage a claim due to limited health care facilities, language barrier. No claim shall be payable under [the Income Protection / Total and Permanent disablement benefit] where any claim arises whilst the life insured is overseas, until such time as the life insured returns to within the territorial boundaries of Australia or New Zealand. Used for immigrants who are on temporary residents of Australia but have or intend to apply for permanent residency and meet the criteria for acceptance. No claim shall be payable under this policy where the claim directly or indirectly arises whilst the life insured is outside the territorial boundaries of Australia or New Zealand, unless such travel is for holiday or business purposes only and demonstrably scheduled for no more than three months duration. Where any such claim meets the aforementioned criteria and is admitted, then after three monthly amounts insured have been paid, The Insurer shall not be liable to make further payments under this cover whilst the life insured is travelling or residing outside the territorial boundaries of Australia or New Zealand, unless the life insured is confined in a recognised hospital, and according to both the appropriate medical specialist at that hospital and in our opinion is unable to travel. Used for immigrants who are temporary residents of Australia, and have no intention of taking out permanent residency, but who meet the criteria for acceptance. No claim shall be payable under this cover for [Life/TPD/Trauma/Income Protection]benefits that occurs whilst the life insured is travelling or residing outside of the territorial boundaries of Australia or New Zealand other than for business or holiday related travel of up to three months in any period of 12 consecutive months. Generally when you are granted permanent residency you can call your chosen insurer and have the exclusion(s) reviewed & potentially removed / revised. Just because you entered Australia on a visa doesn’t mean that you will have to have an exclusion on your policy, there are many insurers and if you are not satisfied with the offer shop around. Listing every conceivable form of residency or visatype to explain the exclusion is not feasible. However, your chosen insurer’s exclusions and eligibility terms should be highlighted in its Product Disclosure Statement (PDS) or the offer document following the assessment of your application by an underwriter from the insurer. Be aware of your options and when in doubt, talk to a specialist like Life Insurance Direct. Life Insurance Direct’s founders immigrated to Australia from South Africa, and have personally gone through the same vigorous processes you’re currently going through. We’ve helped thousands of people, many of whom are on a variety of Visas, obtain life cover. Compare life insurance in Tasmania! We provide fast, accurate and transparent quotes for Tasmanian residents, included guides on life expectancy, stamp duty and more! Compare Life Insurance Quotes in South Australia today! Over 60 percent of our clients from SA over the past 12 months took out a life insurance policy! We provide fast, accurate and reliable life insurance quotes in QLD! Compare life, trauma, TPD and income protection quotes for the sunshine state! If you live in NSW, we can provide you with fast, accurate and transparent quotes to match your circumstances. Stamp duty, life expectancy and cheap quotes! I’m originally from the UK and am currently residing in South Australia (Adelaide) on a Skilled Migration (provisional) visa (subclass 489) and would like to take out Life Insurance and Income Protection insurance. what options are available to me? I am planning on applying for permanent residency in October 2019. • Disclose the country you were born in and your nationality, and any other countries you have citizenship rights. • Lived in Australia for at least six months (or close to). • Generally have a work visa type that allows you to stay in Australia for at least 2 to 4 years. • Plan to apply for permanent residency, as you mentioned. • Confirm you are planning to remain residing in Australia and confirm you your travel plans for the next 12 months, i.e. when and where you’ll be travelling, the duration of each trip and your reason for travelling. It’s best to consult a life insurance broker to help guide you through the application process. You can start by filling in the quote form above or calling us on 1300 135 205.